The hunt for the suspect or suspects in a shooting at a mall has shut down much of Germany’s third-largest city, including public transportation. This is a developing story. The Azusa-to-SaMo trip as seen on Google Maps. It had taken two hours to get to Santa Monica from Azusa, probably not much different than if I had driven. Driving home after dinner, though, might have taken 75 to 90 minutes. Instead, I left on foot at 8:30, boarded the train at 8:55, arrived at Seventh Street at 9:40, boarded the Gold Line at 10:15, got to Azusa at 11:05 and pulled into my driveway at 11:30 — three hours after leaving the restaurant. That was tiring. On the bright side, my round trip cost $3.50, or 50 cents less than my friend paid to park. At about 70 cents per hour of travel, I got my money’s worth. Will that ride ever be quicker? Yes. The Regional Connector project — which is tying together the Blue, Expo and Gold Lines in DTLA — will eliminate the need to ride the subway and eliminate one transfer and make the other one shorter. At some point in the future, the Expo Line will run more frequently and Metro and the city of L.A. working together, may find a way to shave some time off the trip by adjusting traffic signal priority. One thing to stress: 40 miles is a long way to go on a local transit system. The longest possible ride on the New York Subway, for example, is “the train from 241st Street in the Bronx, with a transfer to the Far Rockaway-bound Train (more than 38 miles),” according to the New York MTA. Metro’s sales tax ballot measure may be headed toward the Nov. 8 ballot, but the agency is prohibited by law from formal campaigning and fundraising — although the agency is certainly allowed to provide information about the Los Angeles Country Traffic Improvement Plan. As for the ballot measure campaign, it will be run by the L.A. Mayor’s longtime campaign manager Bill Carrick and his deputy chief of staff, Rick Jacobs, who is taking a leave of absence from work. To learn more about the ballot measure plan, please click here. As we noted the other day, these kind of restraining orders are difficult once work begins. The suit alleges that some of the work to prepare for tunneling would have required easements that Metro doesn’t yet have. “A Metro spokesman said Thursday that the agency “remains confident” that the necessary permits and easements are in place to continue to prepare for tunneling, which is expected to begin later this year,” reports the LAT. Nice piece. Stephen had previously used bike share in Gotham and really liked it — but thought it was something that would appeal mostly to tourists. He expected the same of Metro’s DTLA bike share until he had the chance to try it and found, among other benefits, that: he didn’t have to plan ahead or concern himself with bus/train schedules, he could use it for one-way trips, he didn’t need to bring a lock and that it better connected him to his city. A thoughtful post, particularly for you bike share skeptics. A pair of renderings of the Mercedes bus. Credit: Mercedes-Benz. That’s because it was made by Mercedes-Benz. 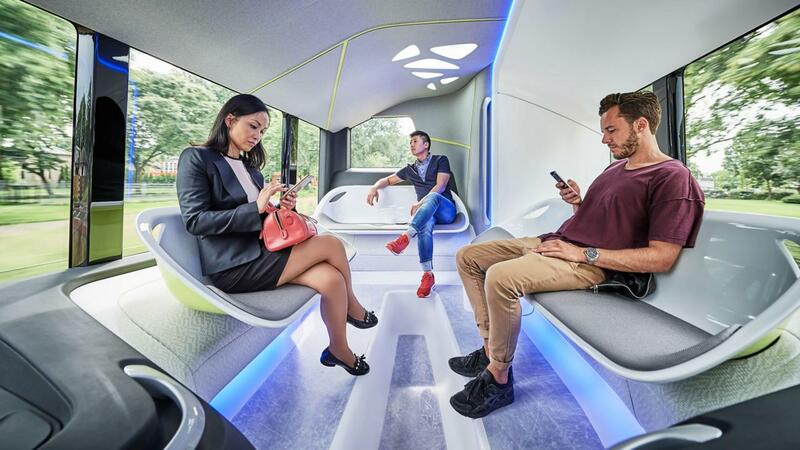 The bus is semi self-driving and will be tested on a bus rapid transit line in the Netherlands. 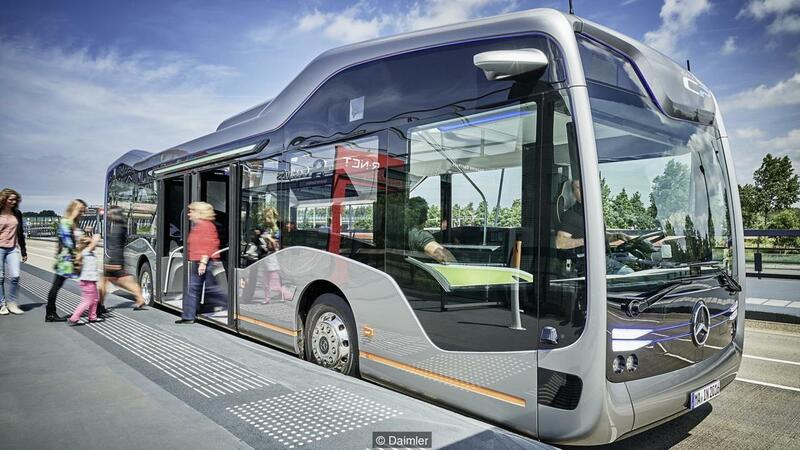 The carmaker is touting the bus as the perfect vehicle for BRT lines. Any chance your team has/could create a detailed map of light rail if the ballot initiative passes? If you recall, Urbanize LA featured one a while ago for 2040 (http://urbanize.la/post/ambitious-fantasy-map-metro-rail). While sadly we won’t have that many lines, it would be very cool to see a map of what is planned by the ballot measure. And if it’s not too much to ask, a street overlay would be great too! Would have loved to see some of those central/west LA lines be included in the plan! This is the map that Metro is using to show the sales tax measure projects: http://theplan.metro.net/#maps. Keep in mind that the environmental studies have not been completed for many of the projects yet, meaning that mode hasn’t been formally chosen. That’s the reason that we can’t produce a map saying that such-and-such will definitely be light rail even though projects are being funded in a such a way that more expensive alternatives such as rail can be built if Metro and the Board decides to do so. Thanks Steve. Not exactly what I was hoping for, but understand the limitations. I still think from a PR standpoint it would be cool to release a mock rail map, with the environmental and other caveats. Re: Azusa to SM: that does make me curious what the transfer plan is once the regional connector is in place. Will it be a timed-transfer type thing, where you get off one train, walk across the platform, and get right on the other? I was a bit sad to find out that the Expo Line will become the part of the route that doesn’t go directly to Union Station, but a well executed transfer would go a long way to alleviating that sadness. More often, get off the train and board the next one on same side of platform going to your desired location. If at that time trains are running every six-seven minutes to Azusa and Santa Monica, then you would have a wait that could be as short as three minutes. Which would still be quicker than going from Expo to subway to Gold. Understandable. Although if the ultimate destination is LAUS itself, not somewhere farther down the gold line, will the transfer time + travel time in regional connector be faster than the transfer to Red/Purple + subway travel time? The value is very clear if traveling somewhere out on the gold line. But when the destination is LAUS (which, with the station revitalization and the hope of CAHSR, will hopefully become more frequent), will there be a significant speed benefit? The one material improvement I can think of is not having to change platforms, but other than that, it seems more of a wash.
What are the limitations/decision points that would let the lines move to 6 minute headways? Is it another symptom of trainset availability, and so we could see it in the next year or two as the trains are delivered? Or will it be a benefit derived from the regional connector somehow? Probably the biggest obstacle is train car availability. Lesser obstacle is the the political and budgetary will to run that kind of frequent service, but it’s a moot point until the rail cars are here. The Regional Connector project — which is tying together the Blue, Expo and Gold Lines in DTLA — will eliminate the need to ride the subway and eliminate one transfer and make the other one shorter. Have the actual routes through the connector been finalized? Is it guaranteed there will be a Long Beach-Azusa line and a Santa Monica-East LA one? And they won’t change it up and do a Santa Monica-Azusa one in addition? It just seems like the last one might be more efficient and save a lot of transfers, since I imagine there would be a lot of Pasadena-Culver City-Santa Monica riders. That’s the operating plan at this time. Hypothetically it could be changed, but I haven’t heard anyone suggest that will be the case. I agree there will certainly be folks traveling between the SGV and the Westside. But I think the idea behind the plan is to keep it simple and consistent for reasons of scheduling, staffing and operator consistency. Traveling from Azusa to Santa Monica with 2 hours? That’s not bad. Sometime it took my mom one hour to travel from Garvey/Atlantic in Monterey Park to Valley/Fremont in Alhambra (2.2 mile), and both line 260/762 on Atlantic and line 76 on Valley are considered high frequency bus. BTW, the real problem about LA’s urban rail system is not transfer, but grade crossing. It limits the speed of the train and the frequency of the service. But as fund is the super excuse for any poor performance, I guess we can’t say anything about it. I probably should have added — as I have in the past — that completing the Purple Line Extension to Westwood could change the dynamic here. Figure it this way: it’s a 48 minute ride from Azusa to Union Station and then will probably be a 25- to 30-minute ride to the end-of-the-line in Westwood on the Purple Line (if you transfer at LAUS, may be faster to transfer at 7th/Metro). So, 80 to 90 minutes to Westwood. Then another 25 minutes down Wilshire to Ocean Boulevard in DTSM. Maybe that will be quicker if Santa Monica is willing to install bus lanes on Wilshire. Perhaps more significantly — and pivoting somewhat — the subway will make a trip between Azusa and Westwood (and UCLA) do-able in 90 minutes or so. That’s currently a transit trip that takes 120 to 130 minutes, according to Google Maps. Yeah, I’ve done it once. Took almost 2.5 hours door to door from Citrus College to Santa Monica College. Would I do it again?? Nope. That trip ended up giving me a real bad migraine as I still need to ride back to Silver Lake a few hours later. Pasadena to Santa Monica is already rough enough on a “causal” basis, having to do it on a daily basis from as far as Azusa would be outright terrifying at best. The Metro seats are really not designed for someone sitting there for an hour, let alone two. I did the same trip David Allen did a couple of weekends after Expo opened and would never do it again. The subway car seats have more lateral room which is important.